Pain, that's awesome, who did your ink? My buddy works in Domestic Relations, one of his clients was in and since she's tattooed he mentioned the show and she said she'd be there cause her hubby tattoos and has a shop. We stopped by to talk about a cover up of a tattoo that's next to this new one, and it turned into a really large new idea that we just started. Should get it finished in another sitting or two. The shop is fairly new, no website that I can find yet. Next month when Abby graduates, For her graduation present I will be giving her something she has wanted for years, Her wish has been for the both of us to get inked together. So next month her and I will be getting this. 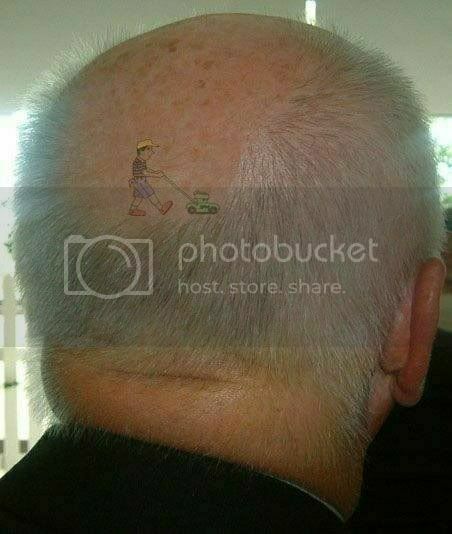 That's awesome, makes the tattoo mean more that way. Thats Beyond AWESOME! I wish my dad were that cool. I love my dad, don't get me wrong, but he doesn't even know I'm tattooed. He doesn't agree with it and I don't want him calling me trash. bleh I still need to take pics of my ink. I need to get more ink, but I've got more important funding for a while. Pain, my brother, that ROCKS! That is some sweet work! CJ, did you notice the trinity you are getting is ALSO on the BotK badge? check the tail of the belt. Mine is the Fu Dog head before it, which is the start of a large piece that as of right now I think will encompass my entire right half minus a sleeve for now. MB, thanks The artist was a surprise find and is amazing so far, I can't wait to get more work done on this, that picture really doesn't do the colors justice. That's really cool as well Michael, I wish I had a unique idea like that that could be shared in such a way. Actually I did not notice, Biut now that you mention it I did look close and I see one difference and that is the circle in the middle of mine. So my daughter and I will be linked by ink to the BotK for ever..
yup...big difference that circle..will be very cool when it is done. It's kinda funny, several of my friends have asked for permission to have one of my Bees, but the silly buggers have yet to do it, despite mine and Tobi's willingness. Thanks. As another "furry celt" I was wondering what it would look like with hair grown in . I really like your cross, but I hate needles - so I'm still a tattoo virgin. I wouldn't necessarily have to put it on my head. There's plenty of mowing available elsewhere. While I was/am out, I started to finish my leg sleeve(the flames most of you know about), well. The new part of it is the topper to it, and Its fast became My fave one. they go all the way around my calf, the exact area they are on was measured in at 17.5in without flexing. each skull is slightly different in some way, and they are meant to look somewhat sketchy, thats sort of the point. Sweet! Those are awesome, bro. Is that your design? sorta. 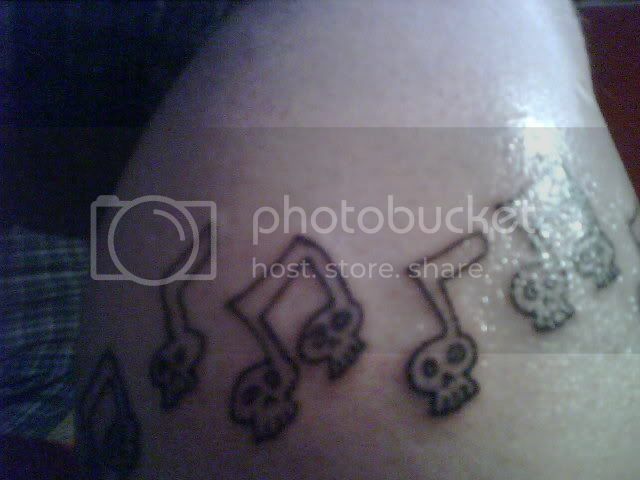 i found a cartoon of music note, made em skulls and drew out the pattern. CactusJack - one of the GALS got that same knotwork tattooed on the back of her shoulder a couple of years ago and I'm so envious of it because that's my favorite knot. I have two tats - I got the first over 3 years ago as a present to myself for passing a milestone birthday. I had wanted one for 4 years and couldn't decide what to get - then got an inspiration in March 2005 and a few weeks later this was done. 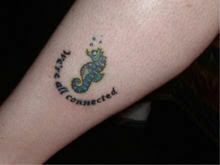 I had the seahorse done first, the words added a few months later. I hate that the lettering turned out kind of "muddy" but I think the tattoo artist rushed doing it. 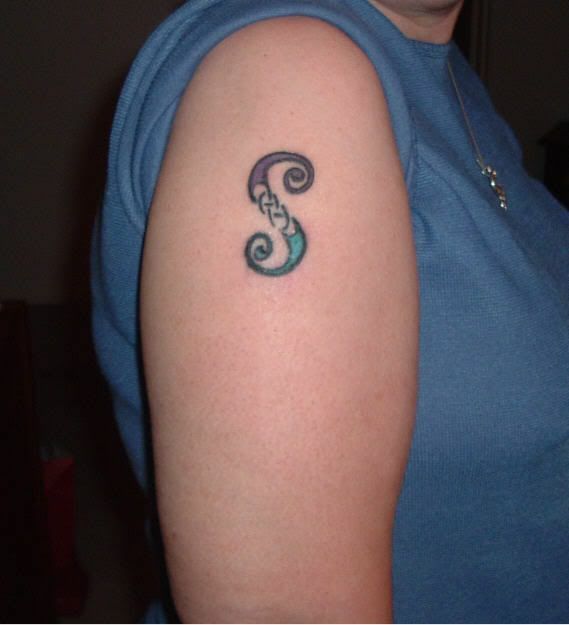 He's the same one who did the seahorse which is so clear and precise. 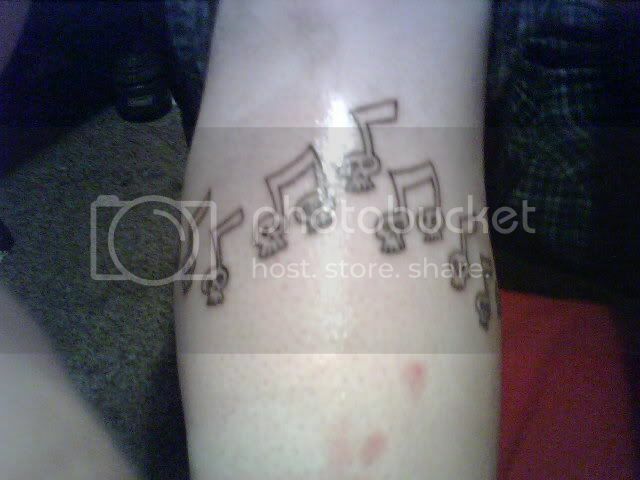 This one I got the same day and place that Holly got her shamrock. It was the Sunday after the first Gerard Butler Fan Convention in Las Vegas, and several of us had decided to get tattooed together to commemorate the event. Four of us actually did it (and 3 of us are now members here). I originally wanted a thistle with knotwork but was talked out of it (may still do it one day) and put my own initial (which also stands for several other words of importance to me like synergy, sobriety, serenity, serendipity, sisters, Scotland, sporran...). I love it but wish the artist had done a neater job on the knotwork. I want to have another tattoo done that starts above it and then trails down the sides, and when I have it done I'll ask the artist to close up the gaps in the knots. I want it to be a ribbon but to look more natural and flowing, so that the trailing ends are more curving as it goes down the sides of the "S". I would still have the top loop of the ribbon look like a heart and have words "The heart remembers" incorporated somewhere in it. This will be in honor of my mom who has Alzheimers (though she is doing great right now). I've been wanting to do something around the "S" for a long time but couldn't decide what and just recently made the decision, now I have to figure out who I want to do it. I would like to get Hannah, from L.A. Ink, to do it because I love her style and use of color, and since I live near L.A. that is a possibility. Neither of my parents know about my tattoos and hopefully never will. I don't think they would approve at all, but I love them! I can't wait till tomorrow, I'll be getting more work done on my leg and will post pictures tomorrow night probably. I have really enjoyed seeing the amazing tattoos everyone has. There is some really beautiful, clever, and humorous body art on display. I was just discussing tats with a couple of coworkers today. I love that I'm not the kind of person that people expect to be tattooed. My chosen profession is considered stereotypically very conservative, and I'm a middle-aged woman who lives a pretty traditional lifestyle. So it gives me a kick when someone notices I am tattooed and comments that they didn't expect it of me. I am of mixed feelings tonight. I sat for a couple of hours today, and we worked on my belly. Bees doing their thing in and out of my belly button. HURTS! As a fella with over 50 hrs in the chair, let us move beyond the silly "I have to pretend I'm really tough" BS, it HURTS! Believe it or not, that isn't what has me all messed up. It's the fact I have agreed to not allow any of the torso work being done this year, to be photographed before the competition, next year. Tobi has asked me to keep our current work on the down low. He has shown me some drawings of whats next. I'm blown away. However, I am going to be able to enter my sleeves in anything that comes up before then, including Kansas City in July. But we are going to debut my full upper torso in April next year at the next round of Nationals. I really, really, really, REALLY want to share what we did today, cause it's so darned cool. But I gave my word, NO photos. So before any of you give me flack about not showing off the new stuff, remember, we can always bring Tobi into the fold, and then you wonderful folks can work on him yourselves.